US President Donald Trump wants to narrow or even eliminate birthright citizenship under the 14th amendment that guarantees millions of people their rights as Americans by virtue of being born in the US. ‘Mint’ analyses the principle and if Trump can eliminate it. What does “birthright citizenship" mean and can it be changed? The 14th amendment to the US Constitution, adopted in 1868 and intended to clarify the post-Civil War status of former slaves, begins, “All persons born or naturalized in the United States, and subject to the jurisdiction thereof, are citizens of the United States and of the state wherein they reside." That has been taken to mean that being born on US soil—even to parents who are passing through—guarantees US citizenship to the child. Changing the constitution requires an amendment that passes Congress by a two-thirds majority and then gets ratified by at least 38 of the 50 states. Has this been challenged before? Many times, especially since the phrase “subject to the jurisdiction thereof" left room for debate over who should qualify for this right. In an 1898 decision, the Supreme Court ruled that a child born in the US to Chinese parents who “have a permanent domicil(e) and residence in the United States, and are there carrying on business, and are not employed in any diplomatic or official capacity under the Emperor of China, becomes at the time of his birth a citizen of the United States". Critics of birthright citizenship say that shouldn’t apply to immigrants living in the US without proper authorization. European nations require a period of residency before bestowing citizenship on those born to foreign parents. Canada, Mexico, Brazil and Argentina have US-style birthright citizenship. Can Trump change the 14th amendment? As a candidate, Trump said babies born on US soil to parents who are not in the country legally shouldn’t have US citizenship. He called them “anchor babies" because once they are adults, they can petition for their parents to gain legal residency in the US. 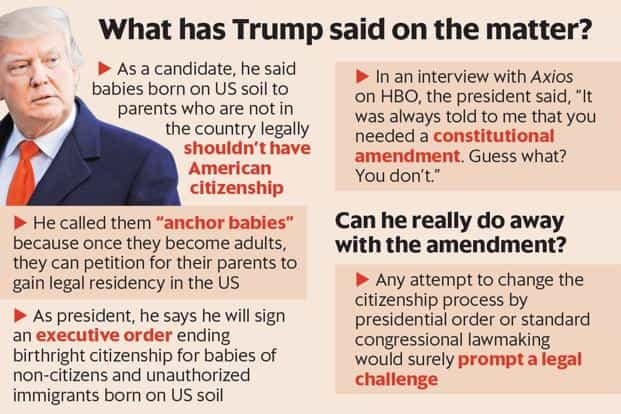 As president, he says he will sign an executive order ending birthright citizenship for babies of non-citizens and unauthorized immigrants born on US soil. But any bid to change the citizenship process by presidential order would prompt a legal challenge. How many people get to be US citizens this way? The Migration Policy Institute estimated in 2015 there were 4.1 million children (under age 18) who at birth had US citizenship and at least one unauthorized immigrant parent. So they could potentially owe their citizenship only to the birthright provision (unless their other parent was American). The Pew Research Center estimated that 275,000 babies were born to unauthorized immigrant parents in 2014—about 7% of the 4 million births in the US that year.